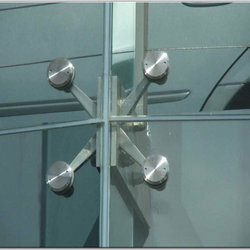 Our range of products include structural glazing spider fittings. We are the most trusted name engaged in offering the quality range of Structural Glazing Spider Fittings. These fittings are procured from reliable vendors of the market, who manufacture these products using the best quality basic material and with the latest technology. Our offered fittings are available in different sizes to meet the various requirements of the clients across the nation. Looking for Glass Partition System ?